Made up of an England international, a Scottish cricketer (who knew?! ), one of this year's youngest volunteers, a man who waxed his chest for CWB, some guy who fell in a stream on a fundraising run and a seasoned campaigner with a thing for women’s scarves, meet Team Kenya! Despite having to cope without the presence of our star player Holly (she had some excuse about playing for England) the team got off to a storming start at the training weekend in September, dominating the skill challenges and winning all their games (not that we were competitive at all!). We leave for Kenya on October 13 and will be based in Nakuru for a week before spending a week in the Massai region. As well as keeping this blog regularly updated we are also being joined by a journalist from the BBC for two days so you may well be hearing plenty more from us over the airwaves at some point. Jamie Burton – Team Leader and the Scottish cricketer. 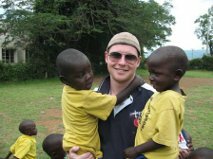 I’ll be project leading Team Kenya and this will be my third trip with CWB having volunteered in Kenya in 2011 and travelled to Oslo with a Captain Scott/CWB XI in January. I currently work as a market insight analyst but my real passion is coaching and playing sport. I’ve built up a good bank of coaching experience including managing the Western Cricket Academy Under 15s, Western Women’s Cricket Team and the Scottish Universities Women’s Cricket Team. 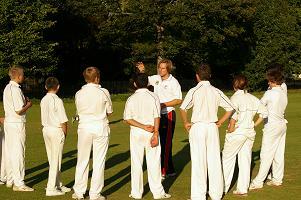 I also won the ICC Europe and ECB Sky Sports Young Coach of the Year in 2010. I’ve been lucky enough to see some of the world through playing and coaching cricket but the highlight was undoubtedly touring Australia with West District Under 19s in 2005. I’m looking forward to meeting up with old friends while in Kenya and building on the foundations of previous trips and the great work that Cricket Kenya does. Sadly we won’t be spending my birthday in Kenya this year – something I’m sure the locals are grateful for! Luke Sellers – Team Tutor and the one who fell in a stream on a fundraising run. I recently completed a two-day 50mile challenge to raise money for CWB but fell in a stream trying to rectify a wrong turn. Taking that into account, I’m sure my fellow team members will feel real confidence in me leading the cricket side of the trip as team tutor! They will be pleased to know that my cricket coaching is a little better than my map-reading or stream jumping. I am a level 3 coach and ECB tutor and have coached in a variety of settings from inner-city schools in Bristol to a senior women’s team in New Zealand and junior county teams in Gloucestershire. I am currently player/coach of Lechlade CC and have played minor counties cricket for Herefordshire. CWB appealed to me as a way of using my skills and experience in a really positive way. I don’t know quite what to expect but am looking forward to the challenge and feel reassured at being surrounded by a fantastic team of people. In addition to my coaching I am a freelance journalist, so along with Holly, I will be updating our blog regularly throughout the trip. Holly Colvin – the England international. This is my first trip with Cricket Without Boundaries and I’m thoroughly looking forward to it. I have just finished my degree studying natural sciences at Durham, so now is the perfect time for me to go to Kenya. I come from a pretty strong cricketing background as I currently play for the England Women’s Cricket team as a left arm spinner and I’m also a Level 2 qualified coach. I have plenty of experience, a few drills and more importantly tonnes of old kit that I can bring to Kenya. My coaching so far has been limited to private schools and summer camps where privileged families simply use them to occupy children in the holidays. On the whole the children have little interest and I find it far from rewarding. I want to coach in an environment where I can really make a difference and at the same time remind me of the reasons why I started playing cricket, the simplicity of the game and how lucky I am to be playing cricket at a high level. Sarah Hickman – the baby of the group. Cricket has been in my life practically since I was born. I currently play for Aston CC in both boys and girls teams and Staffordshire Under 17s as well as the women’s and men’s first teams occasionally. It's the first time I have been on a CWB trip or anything like it but I literally cannot wait to be able to give something back to the sport and to help show people less fortunate about why the game is loved by so many. On the odd occasion I get a weekend off cricket I will most likely be having a catch up with my mates – or episodes of Gossip Girl that I've missed! I’m currently studying geography, history, art and economics at A level and work part time as a lifeguard. I'm a Level 1 cricket coach and although I haven't had much practice, I know this will soon change and I can't wait for it. I just want to get out there and see the impact CWB is having in Kenya, whist having a fantastic once in a lifetime opportunity which very few are lucky enough to have. Jeremy Knott – the one who likes wearing women’s scarves – as shown at the training weekend! This will be my third CWB trip to Africa and I'm really looking forward to it. We have a cracking team of excellent cricketers (and me!). As a village cricketer of dubious quality I'm not sure what skills I'll bring to the team but I've been to Kenya before and done two similar trips so I should know what to expect. It's a lot better than commuting into London every day and I'm excited about seeing Kenya again. I'm in charge of the team's welfare which is an interesting choice, but it does mean I get to choose what we have for snacks mid-morning and afternoon. I'm the old man of the team and I just hope the youngsters can keep up with me and be civil every morning! Thank you to everyone who has sponsored me and to my club Bells Yew Green for their support and encouragement to leave the country for two weeks! James Harrison – the one who has his chest waxed for CWB. I’ve been coaching cricket for six years and am currently a Level 2 coach. I have worked in a range of schools and with varying age groups as well as coaching and playing at Worcester Park Cricket club. I have recently finished my sports science degree at Hull University and having captained the first team I'm hoping that the experience of having to look after an unruly bunch will come in handy in Kenya! This will be my first tour with CWB and I'm really excited about travelling and promoting the HIV/Aids awareness message with CWB and Team Kenya. The numbers affected by HIV/Aids is staggering and the work that CWB do is really worth getting behind and I'm looking forward to being part of that. © 2010 CWB – Kenya Autumn 2012. All Rights Reserved.